“I believe I can fly”, this quote makes many people think of the popular 90′s song by artist R.Kelly. But here at Lehigh, this quote is not only a song lyric but also a reality because I REALLY believe that I can fly…. as a private pilot! 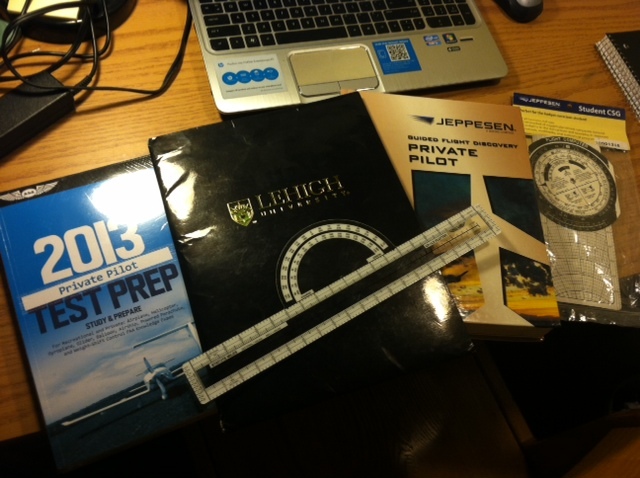 In the spring, Lehigh offers a course called General Aviation Technology and Operations (ME 195). This class is taught by former NASA astronaut Terry Hart. The purpose of the course is to help you get the general knowledge you need to pass the ground school knowledge exam that is offered by the Federal Aviation Administration (FAA). So by the end of this semester I will be able to pass the ground knowledge exam and begin receive practical air lessons since I am certified. Ground school usually costs around $3,000 at a flight school or an airport but Lehigh tuition covers the cost of this class so there are no additional costs. I took this course last spring and already received my FAA ground school certification. Also, since I am staying this summer at Lehigh, to take some summer courses because of the Co-op program, I will be receiving practical experience that adds up to 40 operation flight hours so that I can receive my private pilots license. So I guess that you do not always have to go to flight school or reminisce R.Kelly’s song to believe that you can fly because here at Lehigh, students can make that belief into a REALITY! This entry was posted in Uncategorized and tagged Astronaut, aviation, FAA, Federal Aviation Administration, Flight, ground school, I believe I can fly, lehigh engineering, pilot's license, private pilot, R.Kelly, terry hart. Bookmark the permalink.